« Could We…Should We Pay Off Our Home Early? 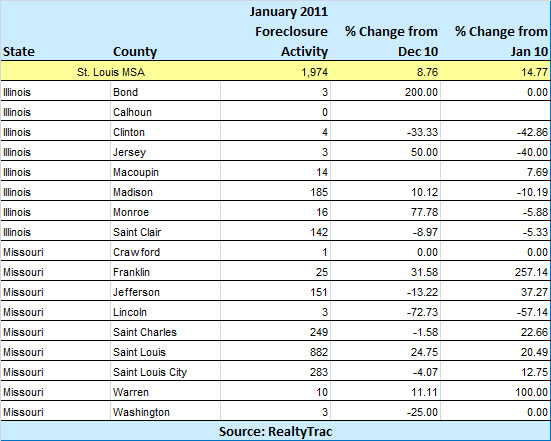 Earlier today I wrote that the U.S. foreclosure rate for January was up 1 percent from December and down 17 percent from the year before….unfortunately the numbers for St. Louis are not that good at all and in fact much worse. According to data released by RealtyTrac, the St. Louis Metro Area foreclosure rate in January 2011 rose almost 9 percent from December (8.76 percent) and was up 14.77 percent from January 2010. When we break down the data by county there is some encouraging data, but overall it is a pretty bleak picture in terms of the amount of foreclosure activity.